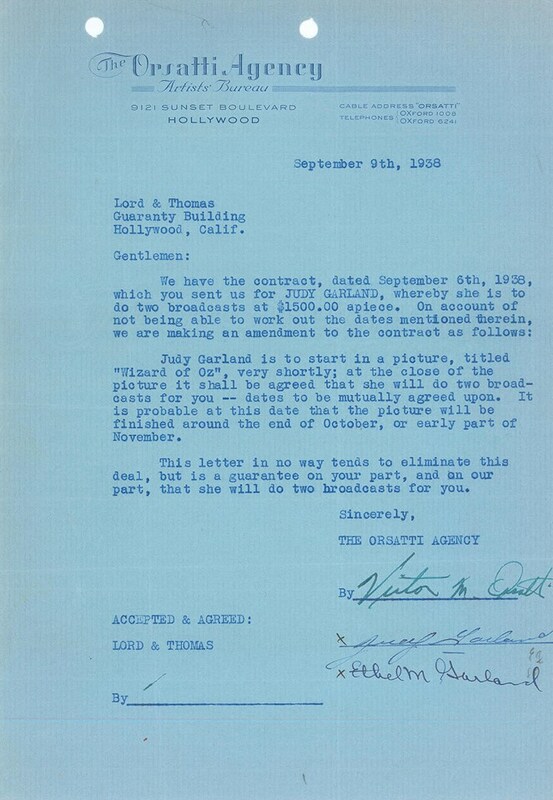 September 9, 1938: Judy’s agent drafted this letter which amends an earlier contract dated September 9, 1938. 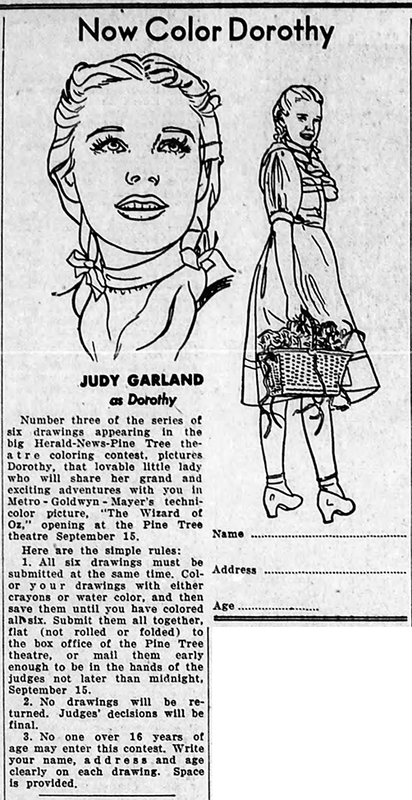 This amendment guarantees that Judy will appear on two radio broadcasts and assumes that The Wizard of Oz would be finished “around the end of October, or early part of November.” Boy, were they wrong! 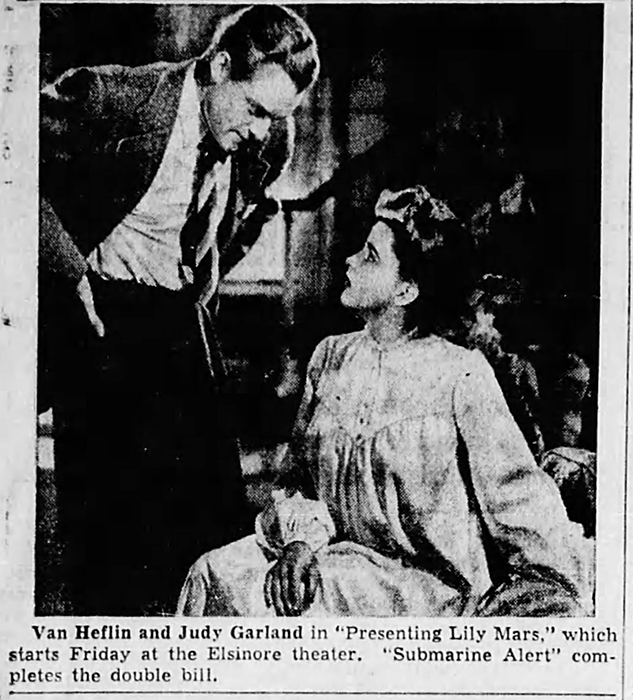 Judy had just appeared on the radio show “Good News of 1939” the day before this amendment was drafted, and would appear on the show again on October 20. Her next radio appearance and last one for 1938 was on the National Redemption Movement Program on December 20. Both programs were on the NBC network. 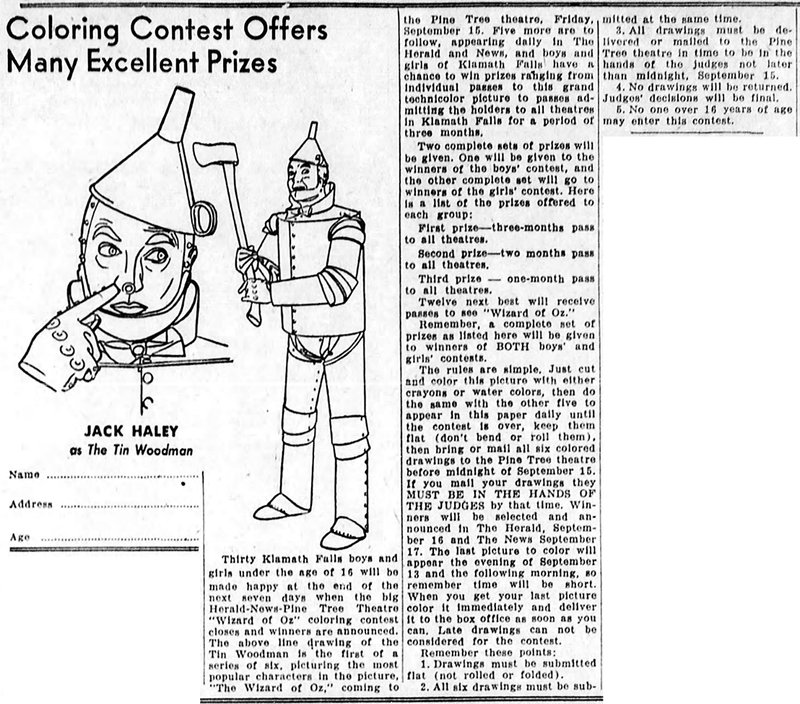 September 9, 1939: “Now Color Dorothy” was the third entry is a series of six (the rest are below) images of a coloring contest held by The Evening Herald in Klamath Falls, Oregon. 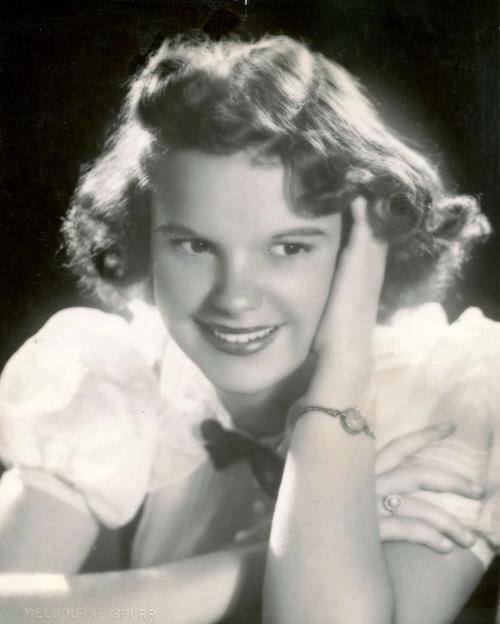 September 9, 1940: Judy spent the day in the MGM recording studio, prerecording “Singin’ In The Rain” and “A Pretty Girl Milking Her Cow” (2nd version, which is version young “Nellie Kelly” sings in the film) for Little Nellie Kelly. 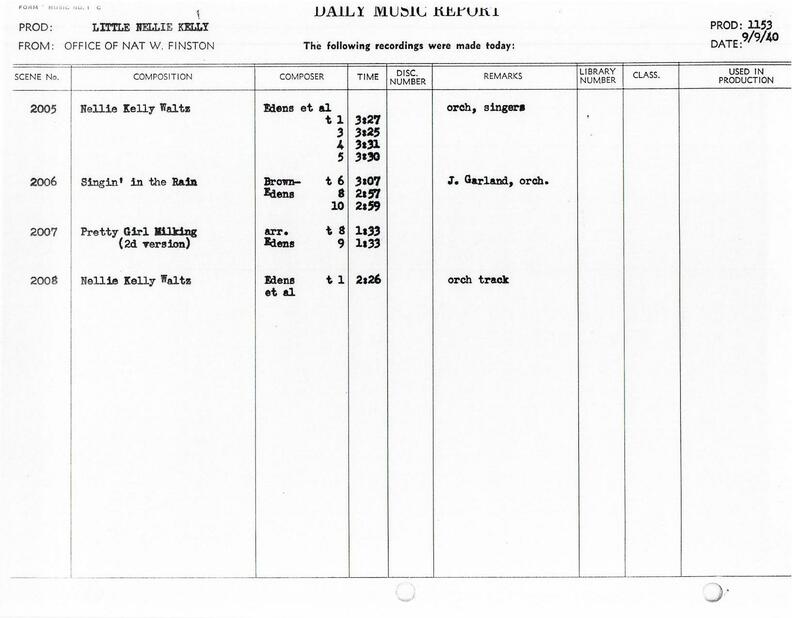 Takes 6, 8, & 10 of “Singin’ In The Rain” were printed as were Takes 8 & 9 of “A Pretty Girl Milking Her Cow.” Also recorded on this date was the “Nellie Kelly Waltz” (“Nellie Kelly I Love You”) of which the Daily Music Report does not list Judy specifically even though she does have vocals in the song. This is the only date the song was recorded so it’s safe to assume that Judy’s vocals were also part of the recordings of the song. Studio records note that Judy was “”Pre-Record and Rehearse Dance” on this day for the film. 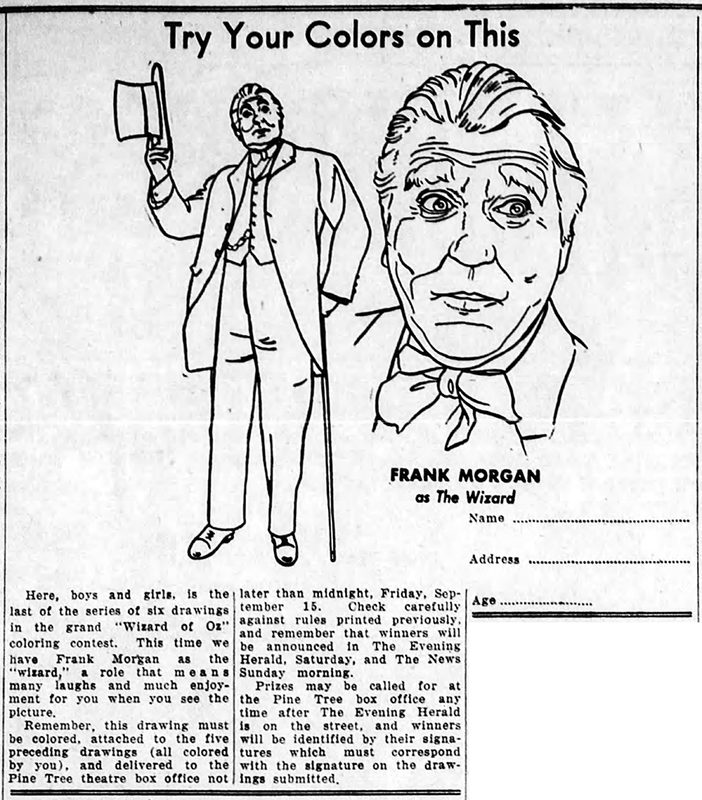 Time called 1 p.m., dismissed: 3:20 p.m.
September 9, 1941: More filming on the ultimately deleted “Convict’s Return” sketch for Babes on Broadway on the “Interior Auditorium” set. 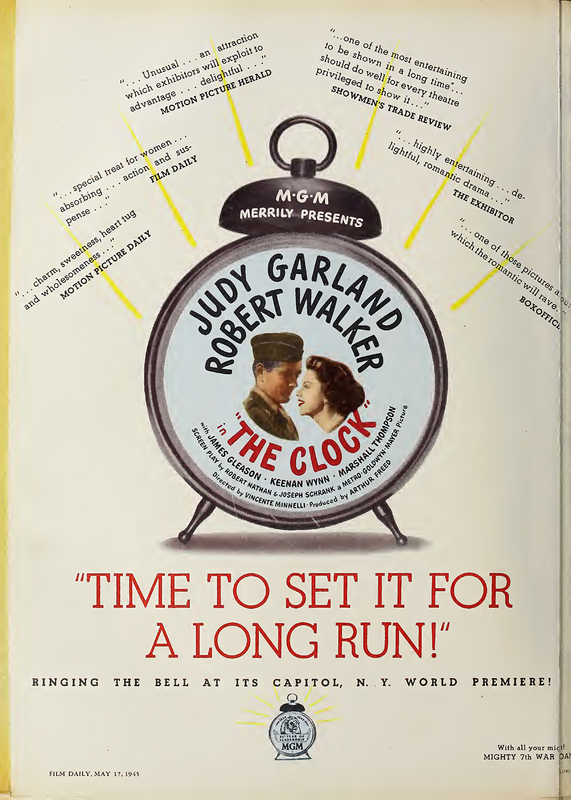 Time called: 9 a.m.; lunch: 12:25-1:25 p.m.; time dismissed: 5:50 p.m.
September 9, 1943: Judy had two films in circulation, Thousands Cheer (in which she had a guest spot as herself singing “The Joint Is Really Jumpin’ Down At Carnegie Hall”) and Presenting Lily Mars. 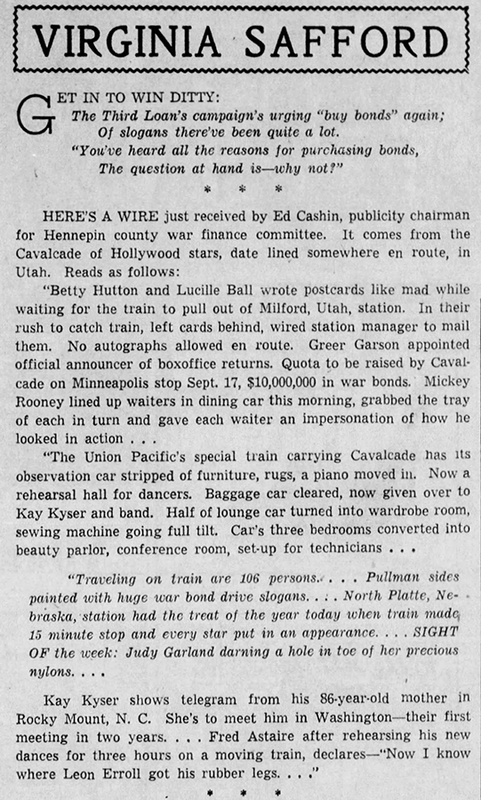 Thousands Cheer was, naturally, used to help sell war bonds. Check out The Judy Room’s Extensive Spotlight Section Presenting Lily Mars here. 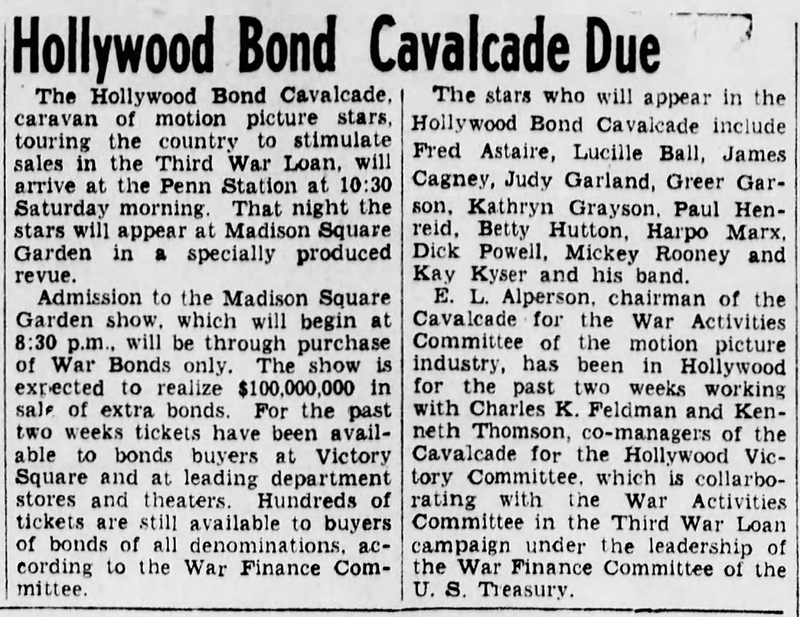 September 9, 1943: The “Hollywood Cavalcade” Bond Tour made its first scheduled stop, in Philadelphia, after the tour’s opening event in Washington, D.C.
Philadelphia went all out, having a bond auction sale on the corner of Broad & Chestnut streets followed by a parade (in which all of the stars participated). Warplanes flew overhead. 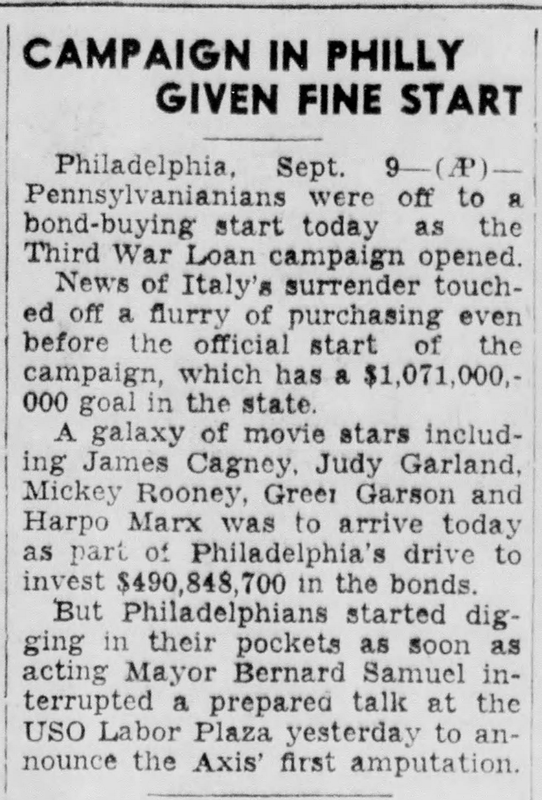 The show/drive took place at Philadelphia’s Convention Hall beginning at 8 p.m. James Cagney was the master of ceremonies, introduced to the crowd by the State Chairman of the bond drive, E.A. Roberts. 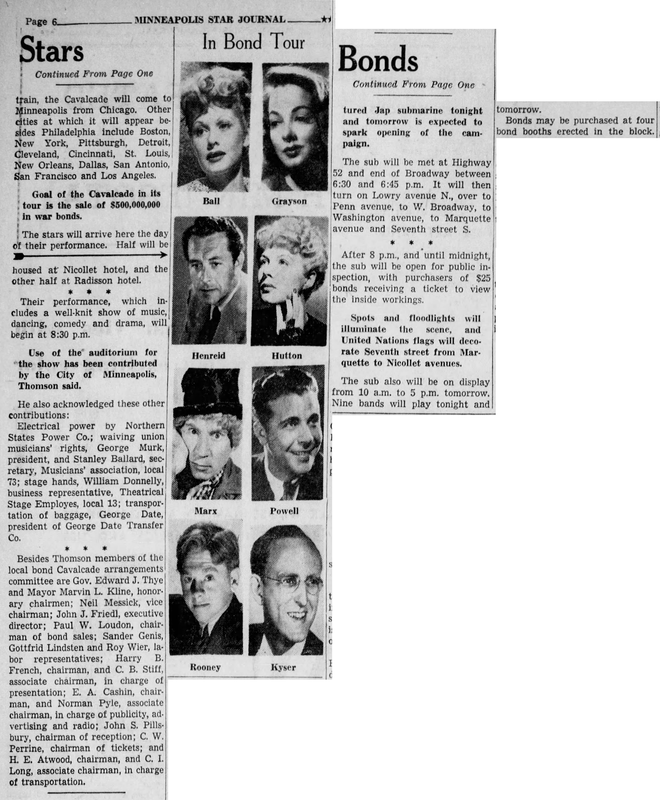 Greer Garson announced the box-office receipts for the performance. Judy’s part of the shows usually consisted of her singing “The Man I Love,” “Embraceable You,” and “Blow, Gabriel, Blow” as well as clowning and duetting with Mickey Rooney. 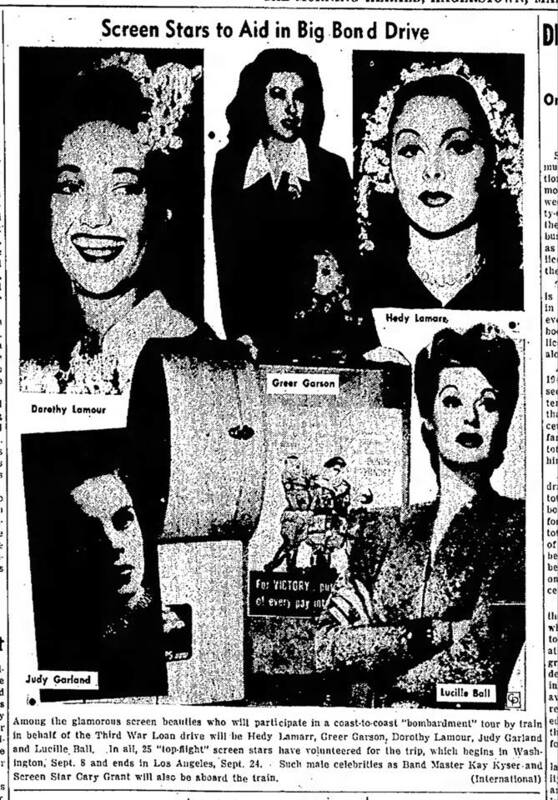 The rest of the stars who participated in Philly were: Greer Garson, James Cagney, Mickey Rooney, Kay Kyser, Lucille Ball, Kathryn Grayson, Betty Hutton, Fred Astaire, Harpo Marx, Paul Henreid, and the “Four Starlet Bondbardeers”: Rosemary LaPlanche, Doris Merrick, Dolores Moran and Marjorie Stewart. Below: Movietone News footage of the Philadelphia event. September 9, 1944: The Clock continued filming on the “Interior Alice’s Apartment” set. Time called: 1 p.m. 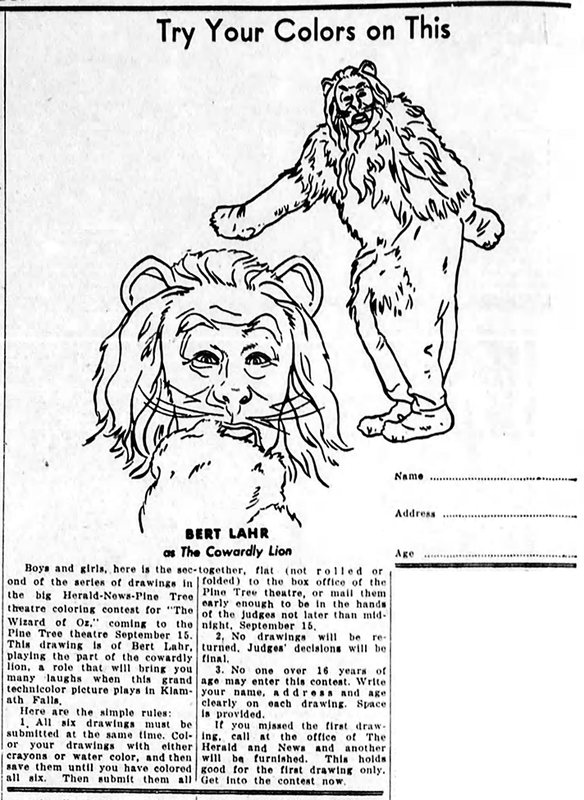 The assistant director’s notes state: Note: original call for Miss Garland was 10:00 a.m. But [she was] ill in morning and unable to report on set until 1:00 p.m. At 9:25 Miss Garland informed asst. director that she was ill this morning. Will notify company later this morning at 11:00 if she will be able to report for shooting this afternoon. 11:30: Miss Garland phoned she would report to studio for shooting after lunch. Company continued to standby. 12:45-1:10 – Wait for Miss Garland to finish makeup, hairdress. 1:10-1:50 – Miss Garland on set. Rehearsals started for benefit of both dolly camera and Director. 2:05-2:35 – Wait for Miss Garland and [Ruth] Brady to get into wardrobe – finish hairdress and final makeup touches: Scene of Alice alone in room – reflecting on date with soldier. Dismissed: 6:20 p.m. 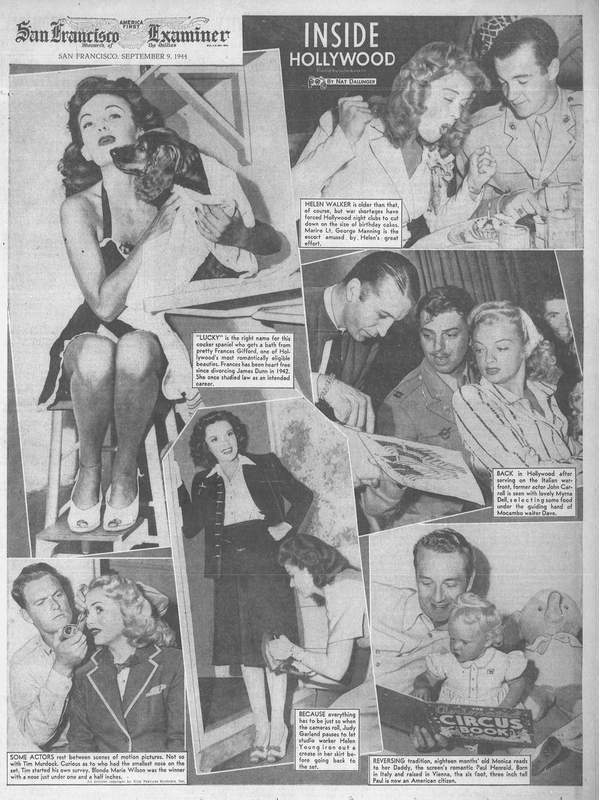 Photos: A photo collage featuring a rare behind-the-scenes photo; A 1945 MGM trade ad promoting the success of the film. 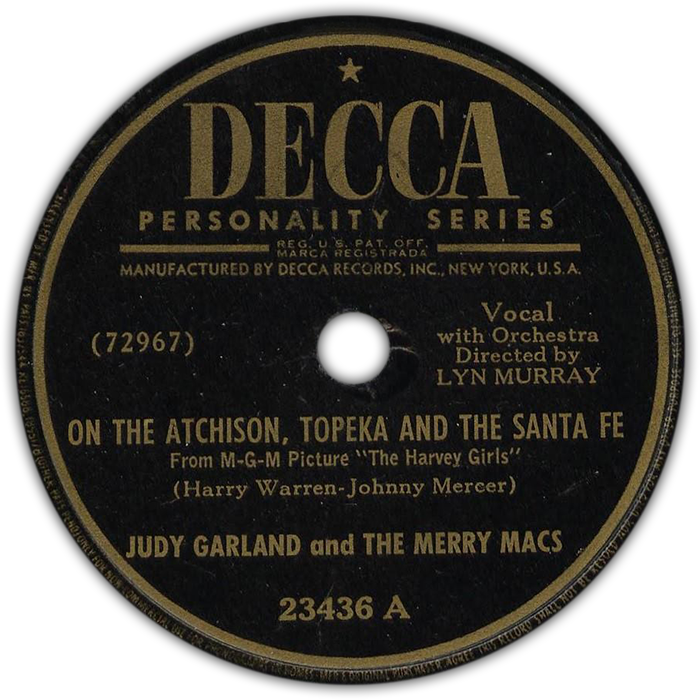 September 9, 1945: Decca Records released Single #23436 which featured Judy’s pop version of “On The Atchison, Topeka, and the Santa Fe” with “If I Had You” (both with The Merry Macs) on the B side. The record was a hit. Judy recording the two songs on July 7, 1945, while on her honeymoon in New York City with husband Vincente Minnelli at the Decca Records New York studios. Judy had previously recorded “Atchison” on May 15, 1945, at the Decca studios in Hollywood. That version, unlike this “pop” version, was an elaborate recreation of the song as it’s performed in the film. 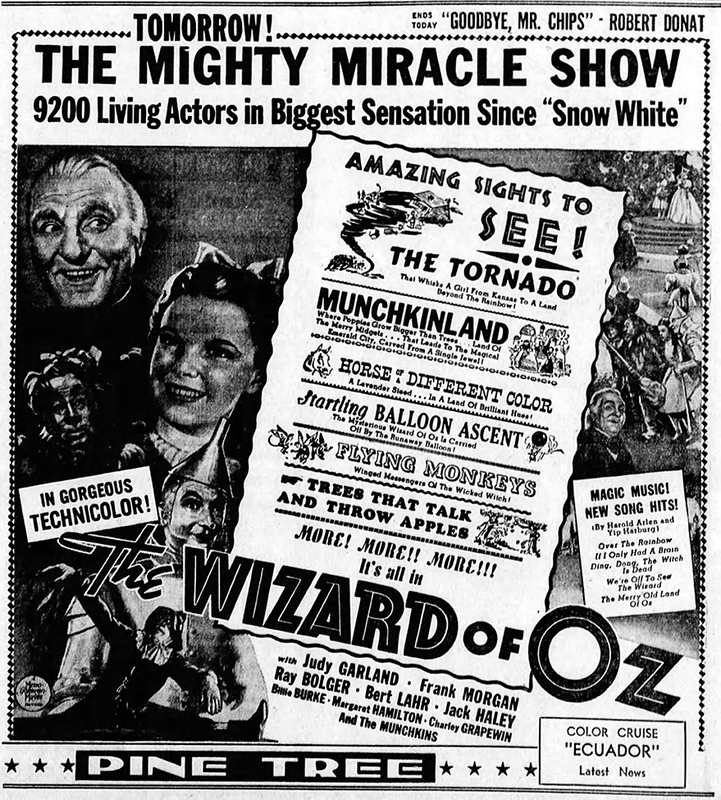 Part 2 of that version was re-recorded on September 10, 1945, with slightly different lyrics: Judy originally sang “What A Lovely Trip” as she does in the film, and ends with the repeat of the song title 3 times at the end (again as in the film). 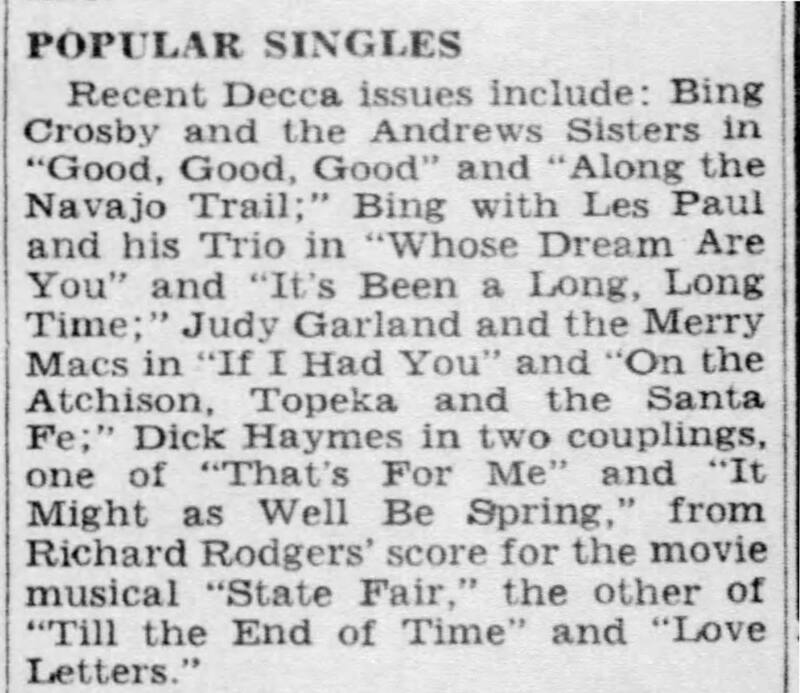 When “March of the Doagies” was cut from the film The Harvey Girls, it was cut from the corresponding Decca 78 album. That meant that there was an uneven number of sides. The decision was made to cut Part 1 (the chorus intro) as that took up one side. B ecause of that, Judy singing “What a lovely trip” didn’t make as much sense without the chorus intro. Judy’s part was then re-recorded September 10th, at which time she changed “trip” to “day” in the verse, and shortened the coda at the end. “Day” contains an open vowel and is thus better to sing, and the shortened coda at the end made the track easier to fit on a 78 rpm. The “day” version is what was originally released on the 78 album on November 1, 1945. Learn more about all of Judy’s Decca Recordings at The Judy Garland Online Discography’s Decca Records Section. 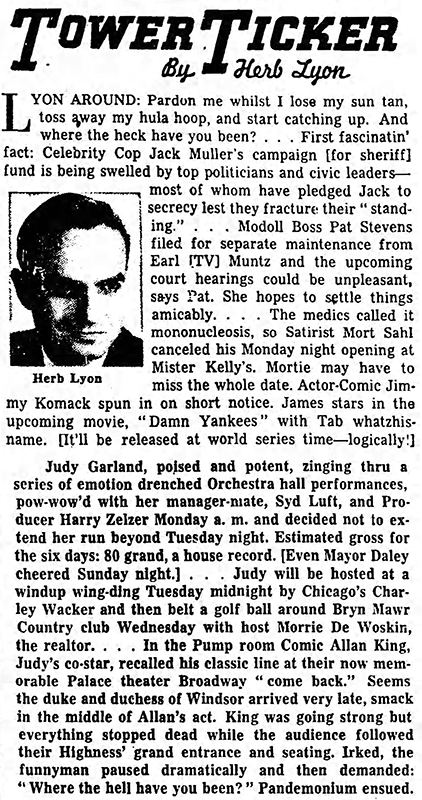 September 9, 1958: Judy’s seventh and final show of her week-long engagement at Chicago’s Orchestra Hall. The weeks’ gross was $78,000, with $57,000 in advance sales. After the show, Judy enjoyed a post-show party given by Chicago’s Charley Wacker, who must have been a junior as the senior Charley Wacker, who was a famous Chicago baseball player, had passed in 1948. September 9, 1962: Rehearsals resumed on Judy’s TV series at CBS Television City, Hollywood, California. The show had been on a three-week break since July 31st during which time the show’s producer, George Schlatter, writers, and choreographer were all fired by the network. Norman Jewison was brought in as the new producers. The next episode that was filmed was Episode Six shot on September 13th with June Allyson and Steve Lawrence as Judy’s guests. 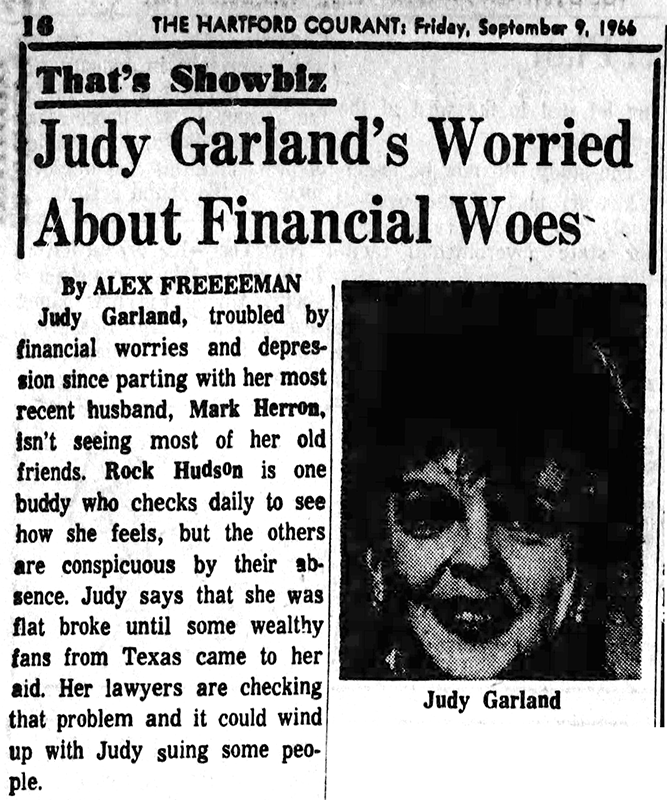 September 9, 1966: Texas fans aided Judy and her financial troubles while Rock Hudson is apparently the only one of Judy’s friends to offer their support. September 9, 1967: Here’s a review of Judy’s opening night at the Merriweather Post Pavilion in Columbia, Maryland. Judy’s second night of the two-night engagement took place on this night. 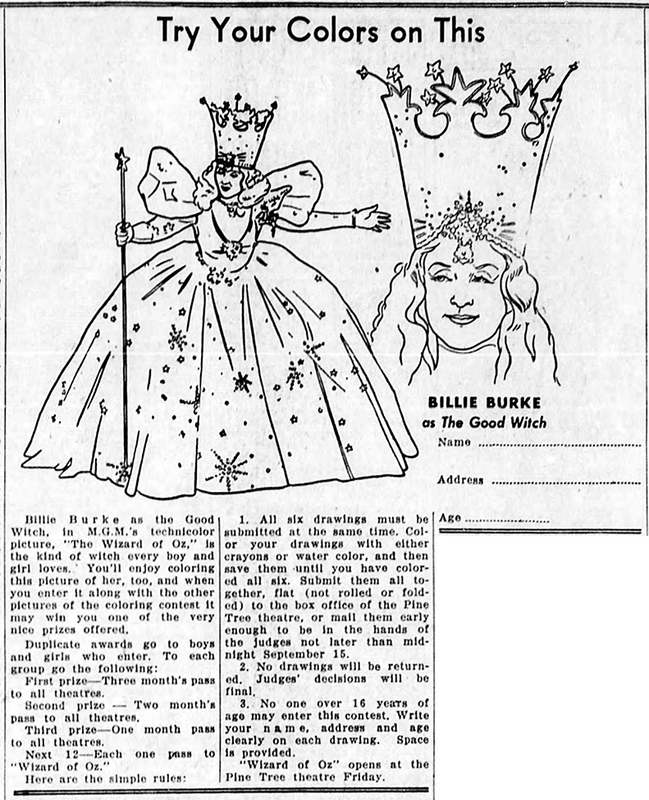 The review, by R.H. Gardner, was (as most reviews of Judy’s show had become) more about the audience and Judy’s cult-like status than anything else. The 3,000 seat theater as a total sellout. “Variety” stated that she grossed $45,000 for both nights. 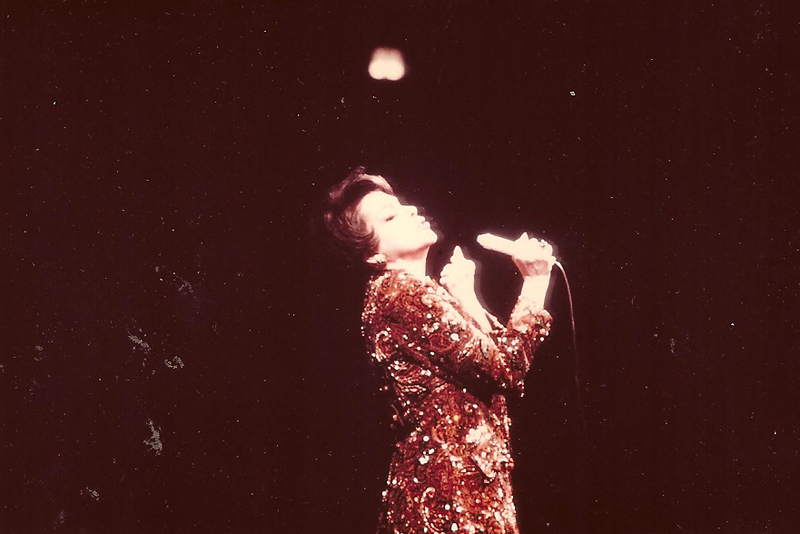 Photo: Snapshot of Judy in concert in 1967. Nice post (as always), but the truth is, BOTH versions of “If I Had You” (possibly my all-time favorite Garland Decca recording) are the alternate take. And you posted likewise last month. Not your fault. Back in 2011, the entire catalogue of Judy’s Decca recordings were restored and released. Unfortunately, BOTH of these versions were released as “the single” and “the alternate take.” A simple, but unfortunate error. The released version (not really heard) since the mid-’70’s is a much more uptempo take. The “alternate” version (and to me, the superior version) wasn’t released until 1985 when MCA released Judy’s songs from “The Decca Vaults.” I FAR prefer the alternate take, as I find it far more sensual; but the version released is now, oddly, the one rarely heard. Thanks for pointing that out. I have never compared the two takes side-by-side, and always just assumed they were slightly different although not much. But you’re absolutely correct. I have swapped out that incorrect version with the LP version which, as you noted, is different. It’s much shorter in length, too. Again, thanks for pointing that out, I appreciate it!